The second week of our Spain adventure takes us to the charming Catalan village of Bordils where we will stay in our own villa, Can Tallada for Journaling with a Circle of Friends, September 17-27, 2016 with Judy Wise and Katie Kendrick. What better way to enjoy and experience Place then spending time playing in our journals together. We'll start off the week making a journal that we will fill with color, line, and fun over the coming days. Judy and Katie will use daily prompts and themes to guide us and give certain tools and supplies for emphasis on varying days. This will be an opportunity to experiment with all the "what ifs" and "I want to try this" thoughts, and whole-heartedly engage with our creative energy, the place and each other as we gather a Circle of Friends. We will meet in Barcelona on the evening of September 17 where we will stay overnight in the Hotel Cram. That night after introductions, we will have our first official dinner together. The next day, we will check out of the hotel, then walk around the city visiting the various neighborhoods before being picked up for the one and a half hour drive to our villa. The villa was built by a Spanish family who made its fortune in Cuba. The turrets, high ceilings, terraces, old water tower, classical fireplaces and Art Noveau floorings are surrounded by beautiful gardens and a swimming pool designed by the famous Dutch landscape architect, Peter Lubbers. We'll have time to explore our new home before gathering for our first dinner. On Monday we will begin by creating a journal with Judy similar to this. There are nooks and crannies throughout the house to spread out and spend time getting lost in your journal. 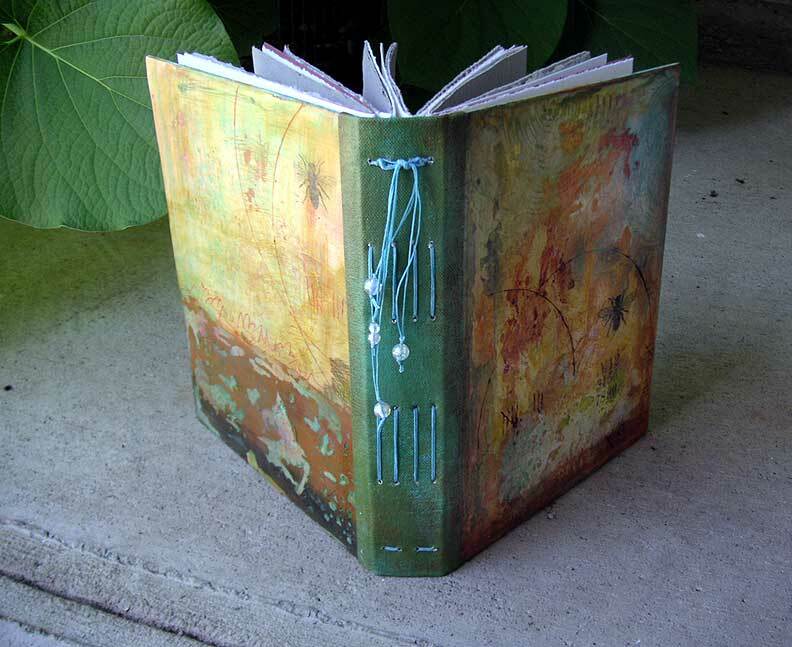 If you know Judy Wise, you know that she is an avid journaler, creating in her journals daily. Here is a page from an earlier trip to Barcelona. On Tuesday, journaling will continue with Katie. The beautiful coast of the Girona province is known as the Costa Brava and is home to some great beaches and beautiful coastal towns and villages. On Wednesday, we will travel the beautiful, rugged stretch of Costa Brava with its rich medieval history, beautiful scenery and artistic heritage. Turning inland, we will venture to the medieval village of Pals. We'll enjoy a menu al dia and also visit a local cheesemaker. That evening we will cook dinner together in the gorgeous Can Tallada kitchen. Thursday we will continue journaling with Katie and Judy, with a lot of down time to just enjoy our surroundings and our Circle of Friends. You'll have some free time to walk into town, go for a bicycle ride, hike or whatever strikes your fancy. Friday we will visit the nearby walled city of Girona that sits on the edge of the River Onyar. 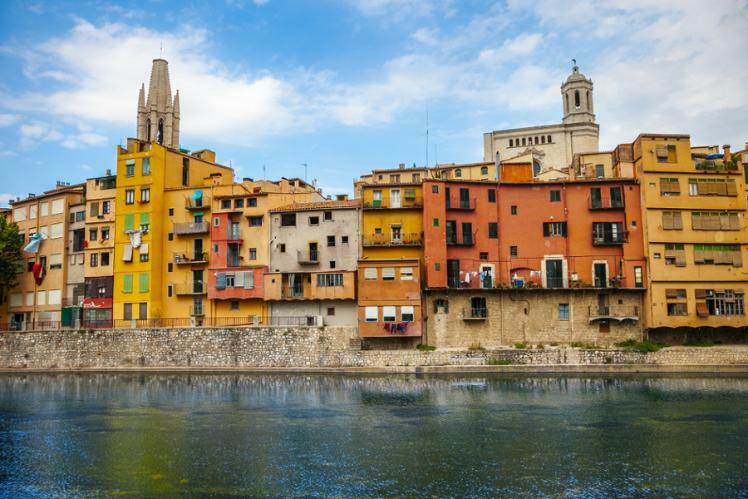 We will walk the walls of Girona, peering down on the narrow streets and buildings painted a range of colors. There is a notable landmark a red metal bridge that was designed by M. Effiel, who built the Eiffel Tower and there are beautiful medieval buildings throughout the city. And a little more notable in modern times, this "City of 1,000 Sieges" will be the backdrop for parts of the the sixth season of Game of Thrones, and from a foodie perspective, this is where the triple-Michelin-starred restaurant El Celler de Can Roca is located, crowned the World's Best Restaurant in the prestigious San Pellegrino awards. That evening we will gather for our last meal in the villa. Saturday morning we will head back to Barcelona where some participants who have been on both trips will leave us. The rest will stay on to explore Barcelona for three days. We will visit the Miro and Picasso museums, and visit the famous Antoni Gaudi designed Sagrada Familia and Park Guell. The trip is over on the 27th and everyone is free to stay on or leave for other parts of Spain. The trip does not include airfare to/from Barcelona. A $1000 nonrefundable deposit is due upon registration. The final payment is due March 1, 2016.